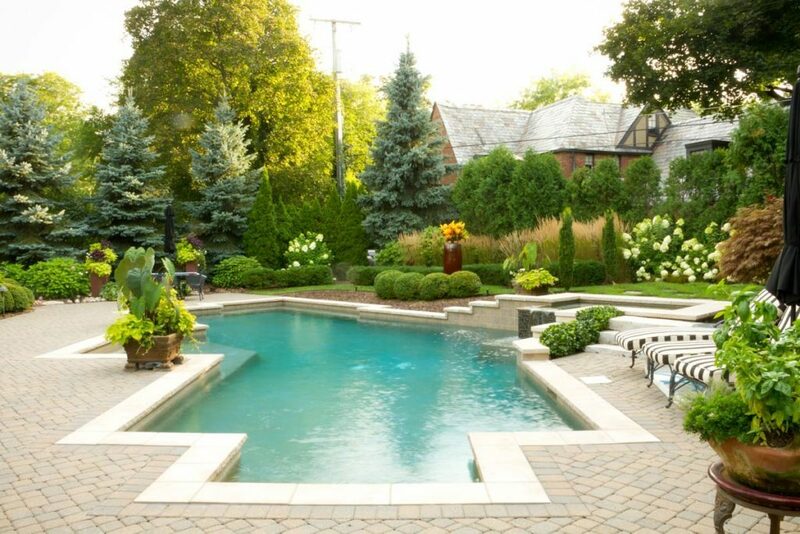 Swimming pools and ponds are a popular feature in many of our larger residential clients’ gardens. 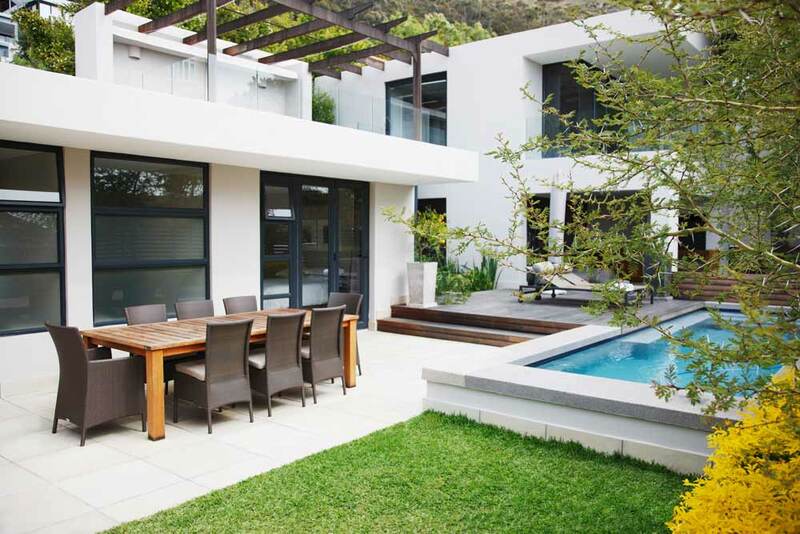 The team at JM Garden Design are highly experienced in their design and maintenance. Ponds, in particular are increasingly sought-after, and encourage lots of different wildlife. Detailed knowledge of which specific plant species are required to help them flourish. Along with the ability to customise water features with ledges, pumps and filters is where our horticultural know-how really comes into its own. If you have a large garden, a large pool and paving area can look amazing. The key to the large design success of such an area is to use high-quality stone. Italian stones provides an elegant frame, with a lush lawn surrounding it to create a natural softness. 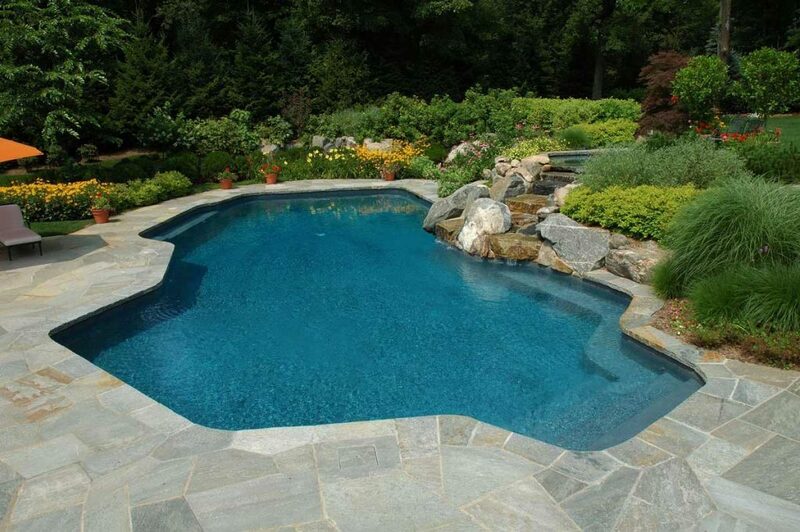 This design illustrates the ideal way to incorporate a pool into the garden. 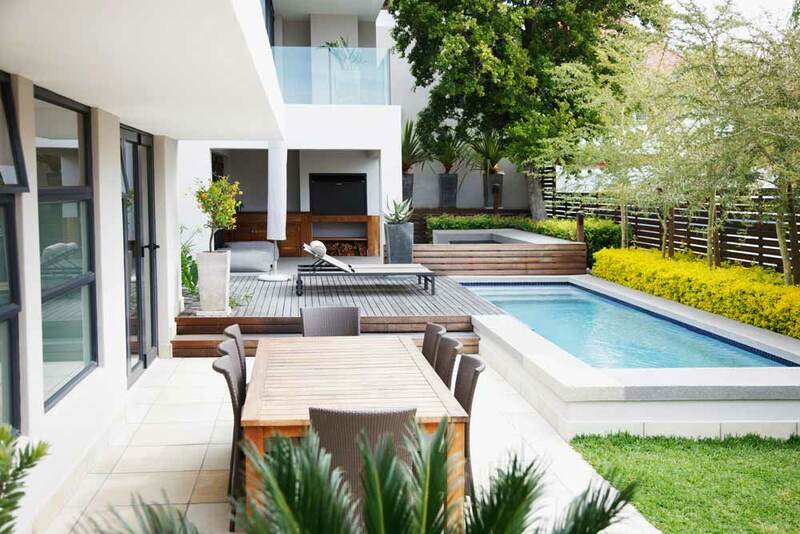 It is a common error to place the pool too close to the house, which can actually create a barrier between the house and the garden, rather like a moat. Although water can have a soothing effect on even the most stressed mind, what we really crave is the colour green, which releases endorphins into the brain. This can be in the form of either grass or plants. 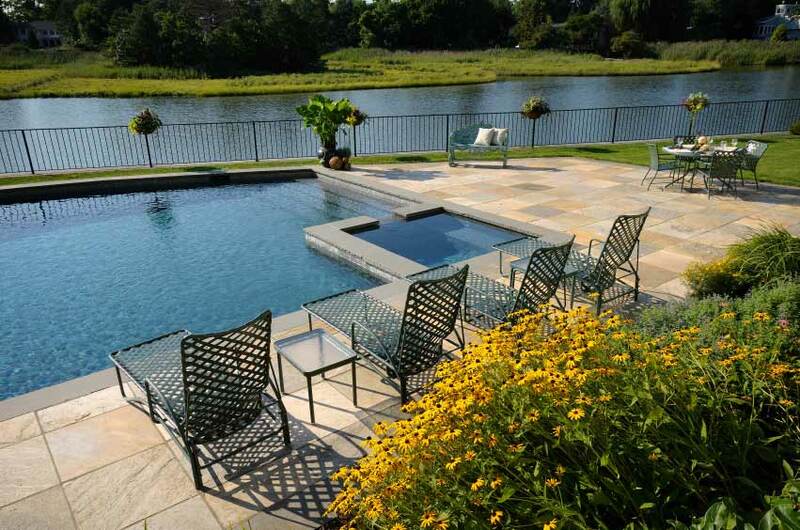 A narrow pool sits perfectly in the midst of seating and planting areas. We have achieved clean, bright lines aside flourishes of nature: a comfortable place to relax. The design features an ‘infinity pool’. Normally it is associated with more exotic locations where a pool backs onto the sea and appears to blend seamlessly into it. Here, designed to echo the beautiful environment. Creating a multi-layered experience of being both a living space in its own right, and a viewing platform. The design called for a humbler stone that lies quietly in meditative hues and does not distract from the powerful panorama. The only boundary is a minimal bar-fence, so the end of the garden and the start of the rest of the world is almost indistinguishable. Clients with small gardens in London don’t usually think of pools as an option. But in fact there are plenty of small pool garden design ideas to consider. 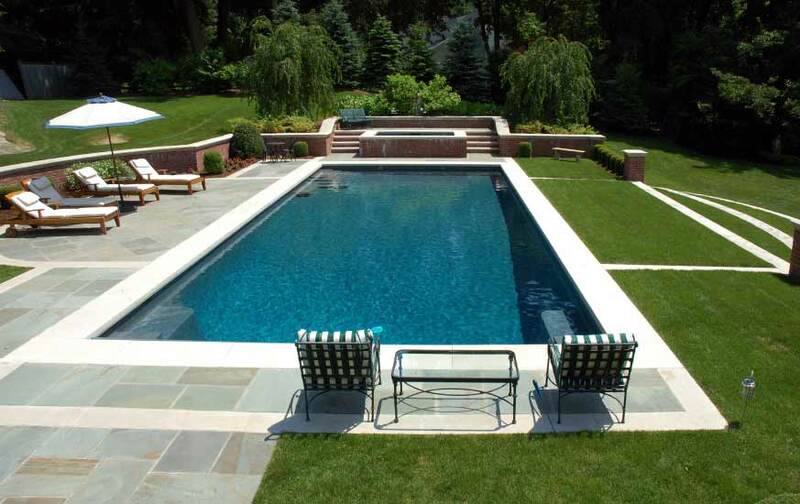 Granite tub-style pools can serve as a classical focal point for courtyard gardens, for instance. 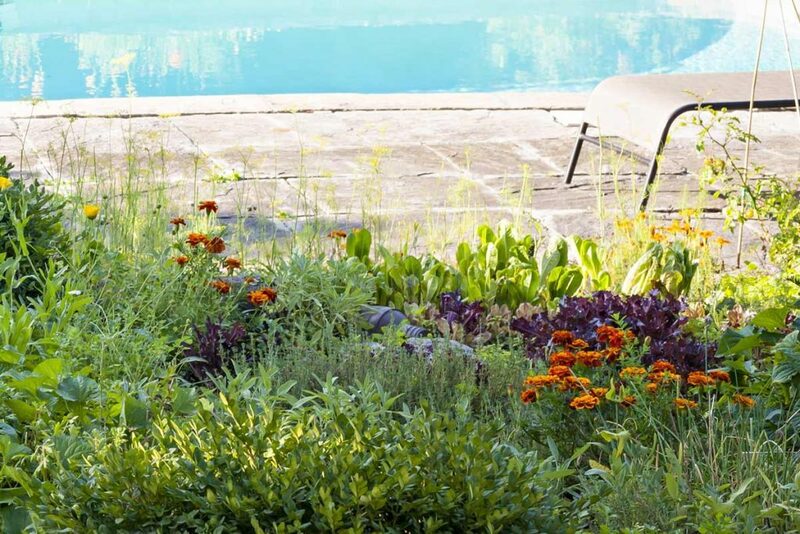 And narrow pools can be designed for small outdoor spaces while still leaving room for other features—even in very small gardens. 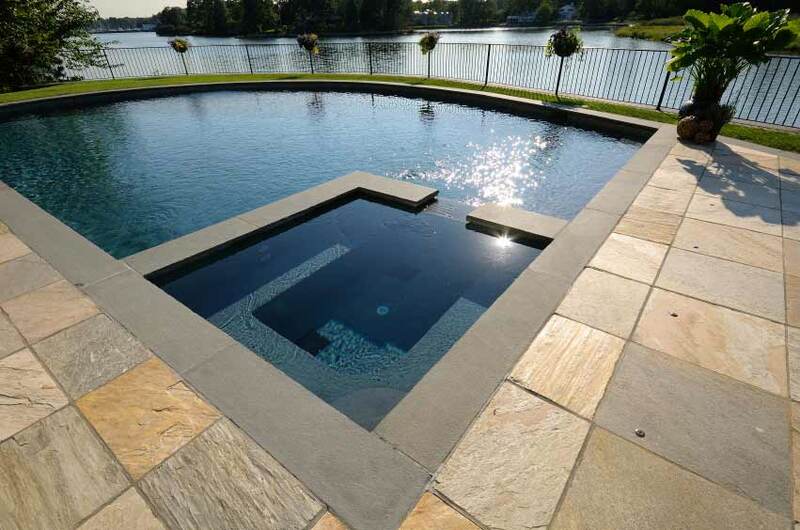 Whether sunken or above-ground, the great thing about pools is that they come in all shapes and sizes. 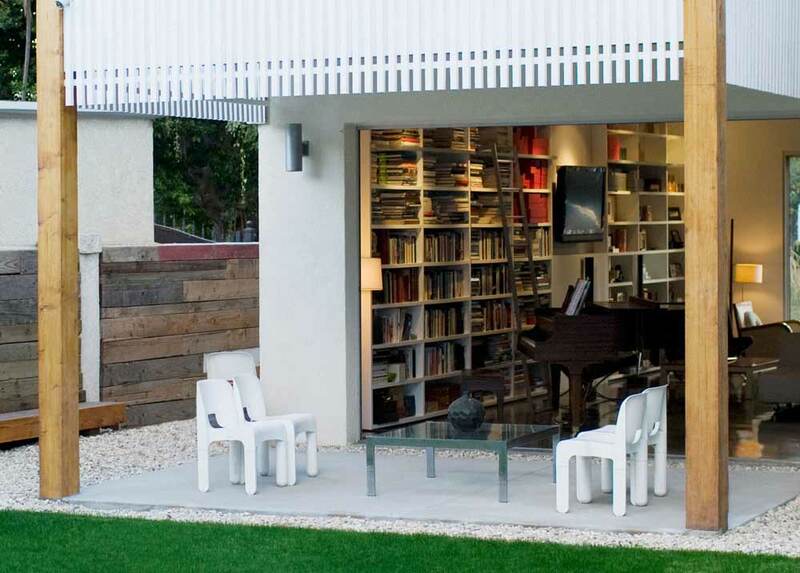 In fact, even above-ground models can be custom-built to suit your particular space demands. What better way to relax than adding a spa to a pool. Pool’s are not necessarily the most relaxing of spaces to sit in more down to their depth and the inability to sit comfortably. Spa’s are not as easy as one might think, whilst it might have the same water, it is important you add more jets for circulation. Using concrete and tiles to form the seat can prove to be a little uncomfortable but nothing a few waterproof cushions wouldn’t be able to fix. The extra effort and cost will be rewarded relaxing. Enjoying an spa with a glass of wine as the sun goes down. 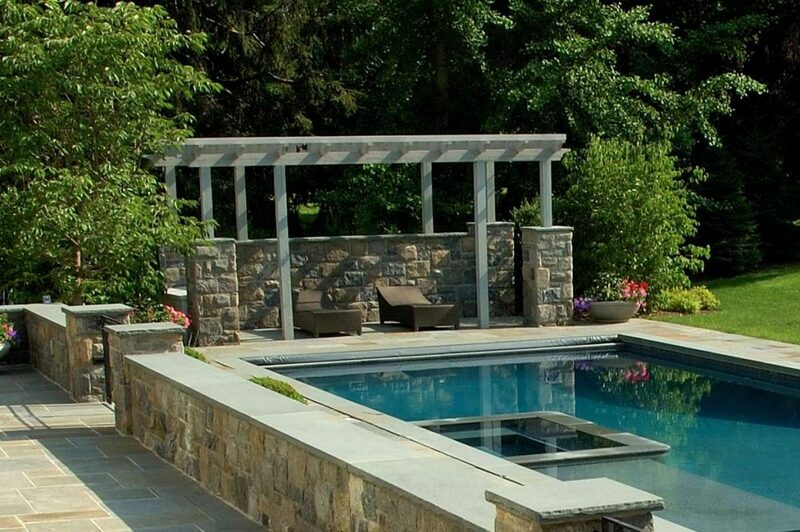 Country landscapes are one of the more challenging backdrops to design a pool in. There are a few additional design features that hide the pool from view. Adding a wall that is of similar colour to that of the paving. Creating a primary feature like a pergola behind the water feature. It takes ones focus away from the pool and to the surrounding features. The key to such a design is again the paving and not the pool. 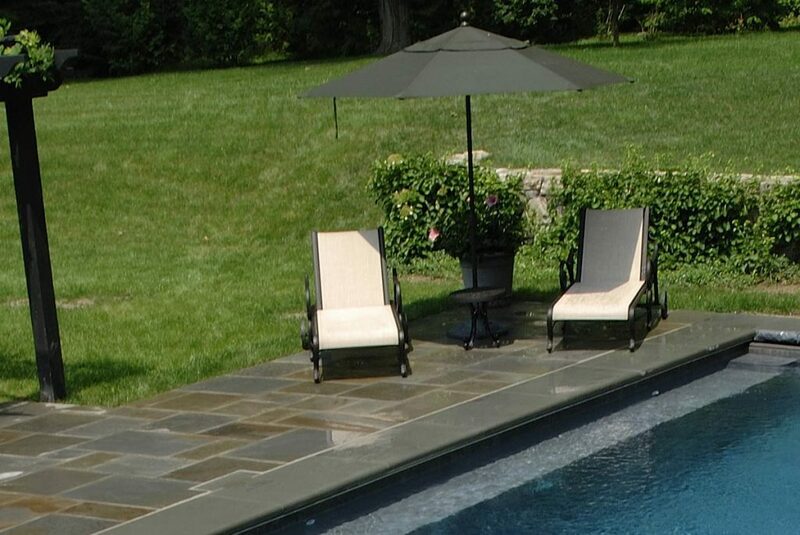 Having mixed coloured stone really adds to the organic look of the poolside. Hiding the pool cover is another challenge. Opting for a thinner than normal cover means the roll is of minimal radius but does not last as long. 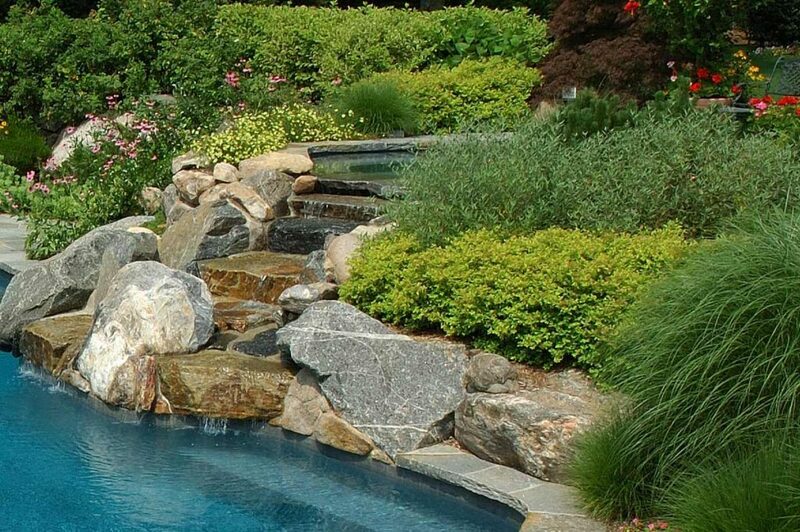 The most technical type of pool whilst providing a great aesthetic would be a rockery stream flowing into swimming pool. The connection between the two is tricky and requires technical know-how as how to connect the material liner with the stream liner along with a variety of different pumps. The sound of running water is far more soothing and relaxing than just looking at water. Instead of dealing with the extra maintenance of such a simple additional feature to the side of the pool creating that sound without the extra maintenance. There is nothing nicer than relaxing around a large pool with your family on a hot summers day, especially if you have an adequately sized garden. The pool nicely sits to the right of the main garden thus creating another room nicely breaking up a space that would otherwise be far to open and large. One key component is having an area large enough to sit and walkaround which will make the paving choice much more restrictive. The paving choice must be such that it is either a lighter buff such as yellow or a more autumnal colour choice. Pools that sit in the garden allowing the surrounding landscape to act as the main feature with lots of differing textures makes for a great backdrop. There is nothing nicer than swimming amongst vegetation. Green areas is does unfortunately come at a price with more maintenance, so a much larger filtration system would be required. These pools are some of the hardest to design. 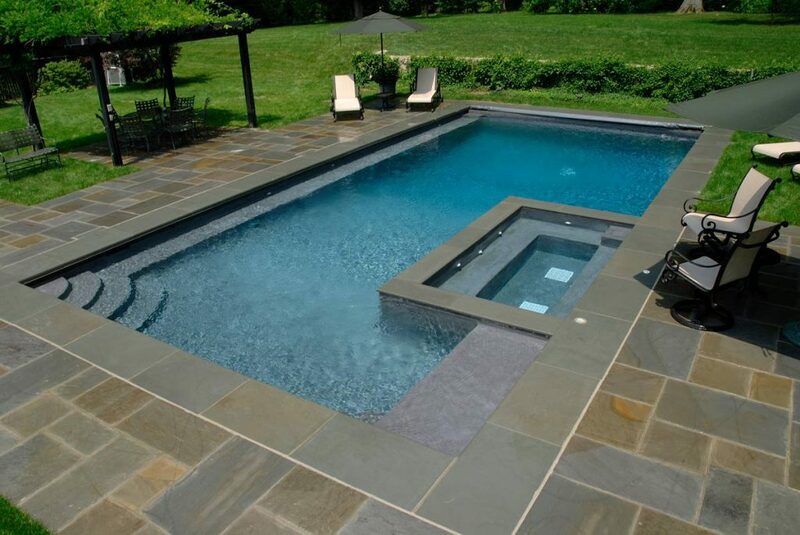 Pools require very rustic natural stone, this stone if not laid well can look a little messy, the pointing is the key. Long rectangular pools act almost as a Japanese reflection pool. 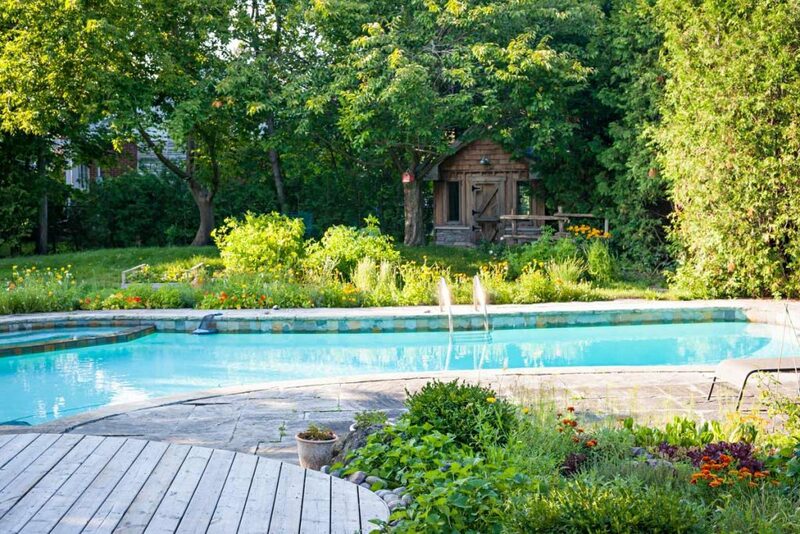 Swimming pools can sometimes detract from their surroundings. Therefore making It narrower and longer gives the illusion that the area of water is more of a natural formed space as opposed to man made along with the usage of a more natural tone stone. 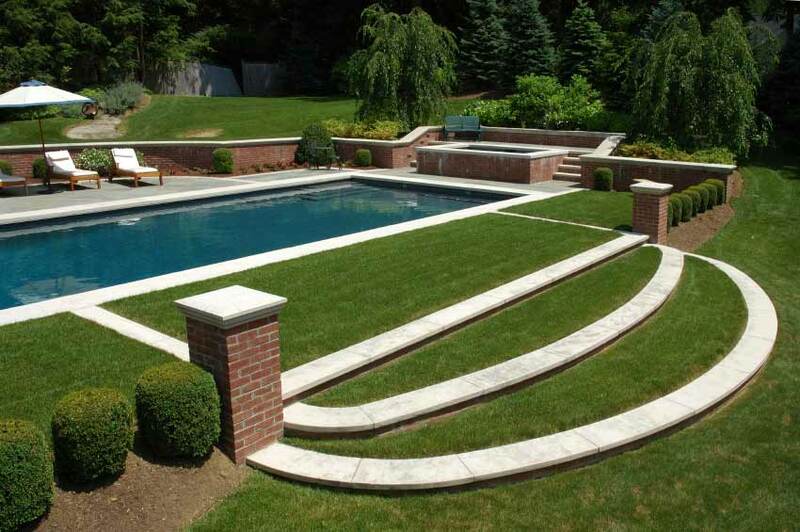 Bricks around the pool can also be beneficial, creating a softer more tranquil space. There is a little more maintenance required with the up keep of these bricks and sand from the joints can find its way into the pool.